Starting an exercise program is one of the best choices you can make for your health. You're embarking on a journey toward a stronger, more energized, and happier you, and in the process lowering your risk of chronic diseases like heart disease, cancer, and diabetes. But once you're putting the work in, you want to be sure you're reaping the rewards. Common workout mistakes can not only impede the health benefits of exercise but can also put you at risk of injury. At the very least, if you're not exercising correctly, it could put a bad taste in your mouth and make you want to quit your program. When you exercise the right way, you should leave your workouts feeling energized and "high" – so much so that you'll be drawn to do it again after recovering for a couple of days. The Huffington Post3 and Men's Fitness4 recently featured some of the top mistakes new exercisers make. Do any of these sound familiar? Warming up helps prime your nervous system for exercise, helping you prevent skipped heartbeats and premature fatigue. This is especially important if you'll be doing high-intensity exercises, which may lead to injury if you're not properly warmed up. To warm up properly, all you need to do is some light activity that causes you to break into a light sweat. Brisk walking, arm circles, marching in place, squats, shoulder shrugs… any (or all) of these can be used to get your body warmed up and ready to exercise. As noted by John Paul Catanzaro, a Certified Kinesiologist and exercise physiologist, it takes 10-15 seconds of muscular contractions to raise your body temperature by 1°Celsius, and a proper warm-up should raise your body temperature by 1-2°C (1.4-2.8°Fahrenheit) – just enough to cause sweating. Less than 25 percent of Americans over the age of 45 engage in strength training,5 but middle-age and beyond is one of the most important times to work out your muscles. Without strength training, by the time you're in your 70s, your muscle strength and tone will have declined by roughly 25 percent from what you had in your mid-30s. You'll lose up to 50 percent once you approach your 90s. Not only does strength training increase your muscle strength and elasticity, but it also builds strong connective tissues, tendons, and ligaments. It helps improve muscle tone, which from a biomechanical perspective is the ability of your muscles and connective tissue to hold your body in position. It also helps build your brain and prevent Alzheimer's by promoting powerful hormones like BDNF, brain-derived neurotropic factor. With good muscle tone, you will be better able to perform everyday activities like climbing stairs and getting out of a chair, as you age. Strength training is also an excellent way to get rid of that stubborn, excess body fat, because working your muscles is the key to firing up your metabolism. Strength training can even help you slow down the aging process. One study showed that strength training in the elderly reversed oxidative stress and returned 179 genes to their youthful level. In other words, it genetically turned back the clock about 10 years. Examples of strength-training exercises include yoga, body-weight exercises, and resistance training using elastic bands and/or free weights or weight machines. You can increase the effectiveness and intensity of your strength training by using the super-slow technique. To achieve true fitness you really need to be able to move freely in all directions without any limitations to your range of motion (ROM), as this is what allows you to participate in all of life's wonderful activities. This is where flexibility training comes in, as it helps keeps your tendons and ligaments elastic and your muscles relaxed. Yoga and Pilates work well for this, but you'll want to avoid static stretching (in which you hold a stretch for 60 seconds or more), especially prior to a workout. My favorite type of dynamic stretching is active isolated stretches developed by Aaron Mattes. With Active Isolated Stretching or AIS, you hold each stretch for only two seconds, which works with your body's natural physiological makeup to improve circulation and increase the elasticity of muscle joints. This technique also allows your body to help repair itself and prepare for daily activity. You can also use devices that incorporate whole body vibration training like the Power Plate to help you stretch and gain flexibility. If you're not sure how to best exercise to reach your fitness goals (whether they be to lose weight, build strength, improve performance, or otherwise), a qualified fitness trainer can be invaluable. He or she can guide you in a fitness program that will be the appropriate intensity and duration to help you meet your goals while avoiding injury. A trainer can also teach you proper technique for exercises like squats or free weights. Even one session with a trainer can give you valuable insights into proper form when you workout. Another option is to use fitness apps for your smartphone or tablet, which can bring customized workouts, videos, and tips from trainers right to your fingertips (and often for free). They can also help you to keep track of your progress – a must for motivation and to keep pushing yourself to reach new goals. Other simple tech gadgets like a pedometer and heart-rate monitor can also help to motivate you and monitor whether you're exercising effectively. When you first start out exercising, you may fall in to the trap of assuming that the more often you do it, the faster you'll see results. But overdoing it at the start is a key cause of injury and burnout. Not only is it important to start slow and build your intensity gradually, but it's also important to give your body adequate time for recovery. An equation to keep in mind is that as intensity increases, frequency can be diminished. For example, as a weak beginner, you can do high-intensity exercise three times a week and not put much stress on your system. But once your strength and endurance improves, each exercise session is placing an increasingly greater amount of stress on your body (as long as you keep pushing yourself to the max). At that point, it's actually wise to reduce the frequency of your sessions to give your body enough time to recover in between. In fact, you need to allow your body to fully recuperate in between sessions in order for the exercise to remain productive, and you may only need one session a week for optimal results. If you're not sure if you're exercising too intensely and/or too frequently, here are seven signs you may be overdoing it. You needn't spend two hours each time you're at the gym. As you'll see below (#7), some of the best workouts are only 20 minutes long… or less. If you're spending considerably longer, you might be overdoing it (or you're wasting time on "busy work"). Are you middle-age or older and wondering if it's too late for you to get in shape? Let me assure you, it's not too late, not even close. Men who begin intensive exercise after age 40 get similar benefits to those who started prior to age 30 – as well as show several health advantages (such as lower resting heart rate) compared to men who do not exercise.8 Exercise only becomes more important as you get older. If you're fit at 50, you're much more likely to be healthy into your 70s and 80s. One study of competitive runners, cyclists, and swimmers, ranging in age from 40 to 81, found no evidence of muscle deterioration -- the athletes in their 70s and 80s had almost as much thigh muscle mass as the athletes in their 40s!9 Further, among those who started exercising at age 50 and continued for 10 years, the rate of premature death declined dramatically, similar to giving up smoking and mirroring the level seen among people who had been working out their entire lives.10 The bottom line? Starting an exercise program, even an intense one, is beneficial at virtually any age, even middle-age and beyond. There's nothing inherently wrong with long distance running or aerobics (unless you overdo it), but there are far more efficient and effective forms of cardiovascular training. High-endurance training, such as running for an hour at a time, puts extraordinary stress on your heart. And while stressing a muscle usually makes it stronger, extremely high stress can have the opposite effect—and when it comes to your heart muscle, this can be bad news. Research has clearly demonstrated that short bursts of intense activity are safer and more effective than conventional cardio—for your heart, general health, weight loss, and overall fitness. Exercising at very high intensity interspersed with periods of moderate rest, a program known as high-intensity interval training (HIIT), is simply one of the best ways to get in shape, in part because it produces a tremendous boost in human growth hormone (HGH), aka the "fitness hormone." One of the best parts is that the workouts are considerably shorter than you're probably used to and involve as little as four minutes of intense activity combined with rest for a total workout of only around 20 minutes. I currently use two forms of HIIT. One is the Peak Fitness method of 30 seconds of maximum effort followed by 90 seconds of recuperation. The other is super slow strength training, which becomes high intensity and provides cardiovascular benefits because the movements are so slow. Are You an Exercise Newbie? If you're new to exercise, it might seem intimidating to get started – but just get moving. Hop on an elliptical machine for a Peak Fitness workout, join a kettlebell or Zumba class, or do a series of squats and push-ups. The more you move, the better you'll feel, and the more inspired you'll be to keep moving tomorrow. If you're really motivated and you have seven minutes, why not get started right now? You can fulfill the requirements for a high-intensity workout using nothing more than your own body weight, a chair, and a wall. Best of all, this science-backed routine only requires a seven-minute investment, as the program calls for as little as 10- to 15-seconds of rest between each 30-second exercise, which should be performed in rapid succession. 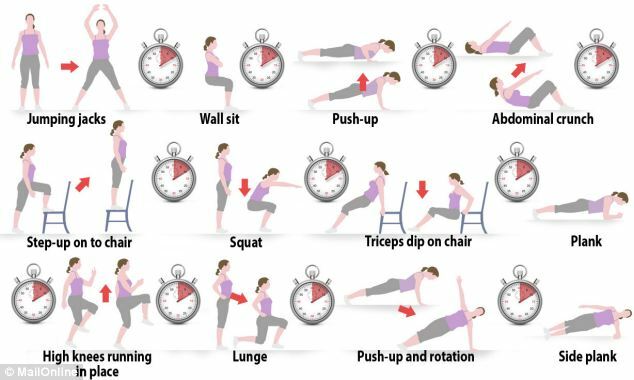 When done at the appropriate intensity, which should hover around 8 on a scale of 1-10, the following 12 exercises, which are outlined in the report, equate to doing a long run and a weight-training session. The exercises are ideally done in the following order, as this allows for opposing muscle groups to alternate between resting and working in each subsequent exercise. Sit Down as Little as Possible. The research is quite clear on this point: the more you sit, the greater the risks to your health. And this applies even if you exercise regularly and are very fit! The key is to keep moving all day long. For ideas on how to incorporate more movement into your day, please see my interview with Dr. James Levine, author of the book Get Up! Why Your Chair Is Killing You and What You Can Do About It. In addition to limiting your sitting as much as you possibly can, I also recommend challenging yourself to walk 7,000-10,000 steps per day. This is over and above your regular fitness program and standing up during work. Consider one of the new fitness trackers that can monitor your steps and your sleep. High-Intensity Interval Training (HIIT): This is when you alternate short bursts of high-intensity exercise with gentle recovery periods. Stretching: I recommend Active Isolated Stretching along with the Power Plate to help you stretch. Strength Training: Rounding out your exercise program with a one-set strength training routine will ensure that you're really optimizing the possible health benefits of a regular exercise program. You can also turn it into a high-intensity exercise by slowing it down. For more information about using super slow weight training as a form of high-intensity interval exercise, please see my interview with Dr. Doug McGuff. I turned 60 last year, and the older I get the more I more fully appreciate the importance of strength training. The majority of my exercise now focuses on it. 6 Med Sci Sports Exerc. 2012 Jan;44(1):154-64.